AND MY JAW JUST DROPPED...CAN I PLEASE LIVE HERE?! 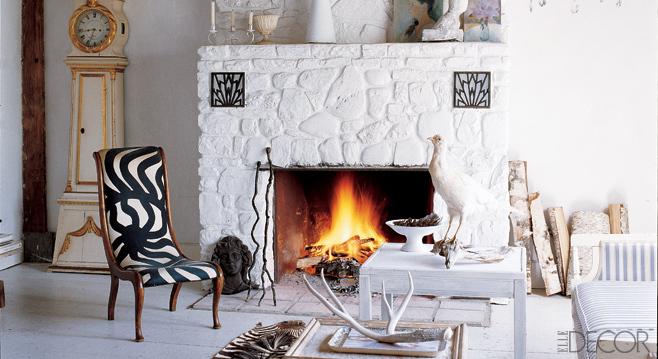 "A painted fieldstone fireplace evokes alpine comfort in the living room at William and Malene Waldron’s farmhouse in Hudson Valley, New York. Eclectic finds such as a Danish chair upholstered in vintage Marimekko fabric, an antique Bornholm clock from Malene’s childhood, and a plaster cast of a horse’s leg from Paula Rubenstein add to the allure." The clock in the left corner is a real classic beauty. That would go great in any home.